It started a as proof-of-concept, checking out AsyncAPI and learning something about it. Actually that topic came to me from two different angles. We where looking into solutions for RPC over messaging (namely AMQP 1.0) instead of HTTP/REST. The second angle was a discussion with a very good friend of mine of “how do you define today an API about messages from the server to the client”. Everyone is talking about Swagger and OpenAPI, but this seems to be all request/response for HTTP based APIs. And then someone mentioned AsyncAPI, I had to look into this. And this is what I came up with so far. ctron/asyncapi is a set of tools, written in Java, around AsyncAPI in general. Reading the specification file into a Java model, a code generator for client and server side code, a few base classes which the generate code makes use of. The definition file parser still is not optimal. The idea is that the definition is based on JSON schema, but I couldn’t find any good support for JSON schema in Java at the moment. So right now it all home-brew and although it does get the job done, I don’t think it is pretty. The code generation is a bit more sophisticated. The idea of taking this out of the Maven plugin came pretty early. I guess it would be cool to have a gradle plugin at some time in the future and the Maven plugin really is just a small wrapper around the code generator. So that should easily be possible. The code generation is backed by Eclipse JDT, which allows you to create and parse Java code in a DOM style way. I am constantly torn apart between liking and hating this at the same time. I did work with generic model-to-text tools in the past, and tools like Acceleo or Xpand are way easier to read than Java code generating Java code in that way. On the other side you would need a full blown Ecore model before and then wrap this again by a Maven plugin. I am not sure this is fun either. Also, using the DOM approach, it is quite simple to write extension modules for the code generation, which allow to actually process the generated Java DOM and extend it, without the requirement to write an awfully complex code generation template. So let’s see where this is going in the future. Don’t expect productive code … yet 😉 Currently the code generator will create the defined types/schemas, the messages and their payload. Topics will be parsed into services, versions and actions and generate Client and Server interfaces. 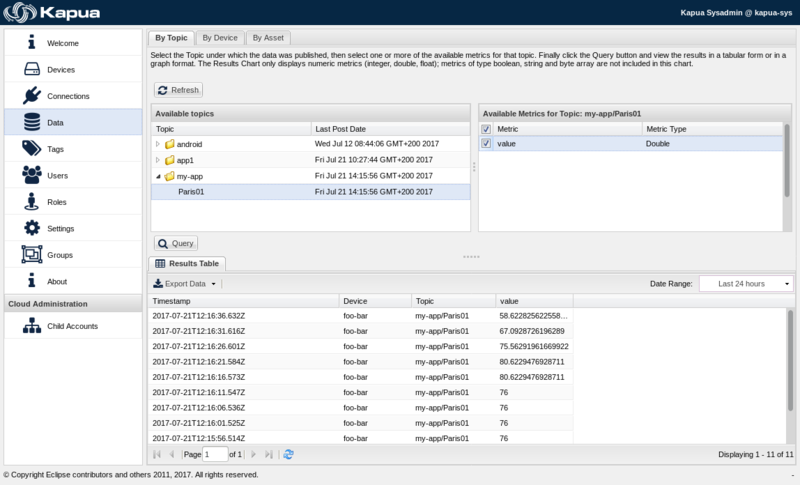 Also is there a client and server implementation using AMQP and Qpid JMS. This already allows you to communicate between client and server. Right now GSON will be used for creating JSON payload serialization. But I think that it should be pretty simple to swap this with e.g. Jackson. The AsyncAPI specification actually defines a bit more than the tooling can currently handle. The server section is missing, various meta data like license and descriptions are not supported. But the most important thing which is currently missing IMHO is some implementation backed on MQTT. Not that I am a big fan on MQTT, I would prefer AMQP over that in this case. But I would like to see two different AsyncAPI partners communicate via MQTT/JSON. One of them being generated by this tool-set and the other one based on something completely different. Also is JSON schema more powerful than what the parser can currently handle. I am not sure if JSON schema and Java is a very good fit, but if you want to go AsyncAPI, then you need to work with JSON schema. And this toolset needs to do a better job here. The AsyncAPI Maven plugin takes the code generator from the main tools project and wraps in into a Maven plugin. The idea is to simply drop in you AsyncAPI YAML file and let the Maven plugin generate the code for it. Of course this is Eclipse M2E aware, so that you can simply safe your YAML file and Eclipse will on the fly generate new code for you. Interested in how this would look like in the form of source code? Well, here are some examples. Also be sure to check out my examples repository. There is a lot to do. Really, a lot! I would like to make an interop test with MQTT. There are several fields from the specification which are currently not supported. The server side JMS API isn’t really suitable for JEE style programming, especially when it comes to container managed JMS. So I hope I will find some time to work on the MQTT backed implementation, because that would validate that two different AsyncAPI tools could work together. And I think this is what it is all about. The initial idea of why I looked into AsyncAPI was to get message based request/response. Well, that is something which AsyncAPI doesn’t really provide. But, to be fair, it would only require a few changes to add this to the specification. A few weeks back, while being at EclipseCon France, I did stumble over a nice little gadget. There was talk from MicroEJ around Java on microcontrollers. And they where showing an IoT related demo based on their development environment. And it seemed they did have Eclipse Paho (including TLS) and Google Protobuf running on their JVM without too much troubles. 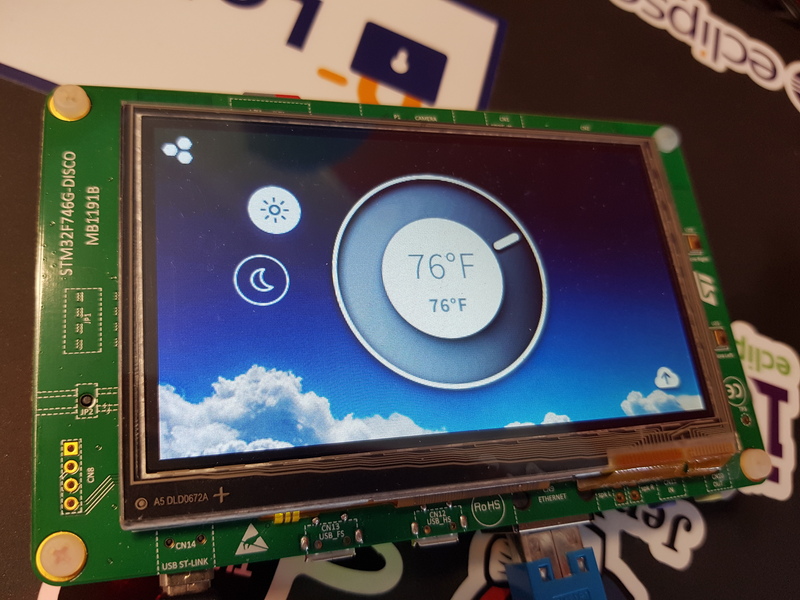 My first idea was to simply drop the Kapua Gateway Client SDK on top of it, implementing the cloud facing API of MicroEJ and let their IoT demo publish data towards Kapua. After a few days I was able to order such a STM32F746G-DISCO board myself and play a little bit around with it. It quickly turned out that is was pretty easy to drop some Java code on the device, using the gateway client SDK was not an option. The MicroEJ JVM is based on Java CDLC 8. Sounds like Java 8, right? Well, it is more like Java 7. Aside from a few classes which are missing, the core features missing where Java 8’s lambdas and enhancements to interfaces (like static methods and default methods). Rewriting the gateway client SDK in Java 7, dropping the shiny API which we currently have, didn’t sound very appealing. But then again, implementing the Kapua communication stack actually isn’t that complicated and such an embedded device wouldn’t really need the extensibility and modularity of the Java 8 based gateway client SDK. So in a few hours there was the Kapua micro client SDK, which doesn’t consume any dependencies other than Paho and Protobuf and also only uses a minimal set of Java 7 functionality. The second step was to implement the MicroEJ specific APIs and map the calls to the Kapua micro SDK, which wasn’t too difficult either. So now it is possible to simply install the “Kapua Data Channel Provider” from the MicroEJ Community Store. Alternatively you can compile the sources yourself as the code for this adapter is also on GitHub. Once the data channel provider is installed you can fire up any application consuming the DataChannel API, like the “Thermocloud” application, and publish data to Kapua. Please be sure to follow the installation instructions on the Kapua data channel provider for configuring the connection to your Kapua instance. As the micro client is capable of running on Java 7, it might also be a choice for people wanting to connect from Android to Kapua without the need to go for Java 8. As Java 8 on Android still seems to be rather painful, this could be an option. I would like to thank Laurent and Frédéric from MicroEJ, who did help me fix all the noob-issues I had. The deadline for the evaluations of phase for Google Summer of Code are pretty close. 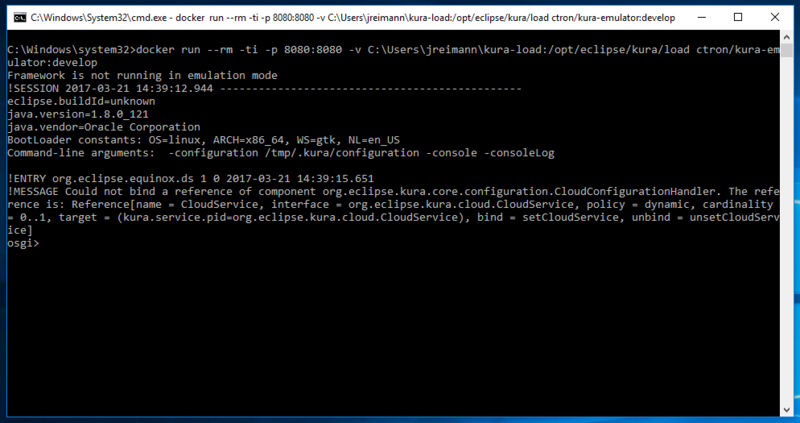 So it was time to take another look at what Arthur did with the logistics simulation for Eclipse Kapua. The first phase was focused on creating a simple logistic network simulation and pushing telemetry data to Eclipse Kapua. The data isn’t realistic and that is ok, since this never was a requirement for the simulation. The second phase was focused around creating a simple dashboard for visualizing the data generated by the simulator. randomly generated and figuring out which vehicles could drive on which roads between locations would simple be too much for this project. There are still a few rough edges and the next phase will be focused on cleaning things up and making it consumable by people to play around with it. While working on Eclipse Kapua, I wanted to do different tests, pushing telemetry data into the system. 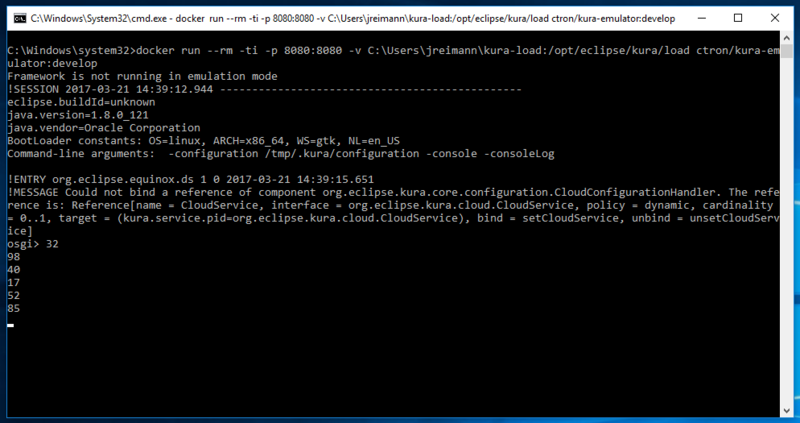 So I started to work on the Kura simulator, which can used to simulator an Eclipse Kura IoT gateway in a plain Java project, no special setup required. Now that helped a lot for unit testing and scale testing. Even generating a few simple telemetry data streams for simulating data works out of the box. 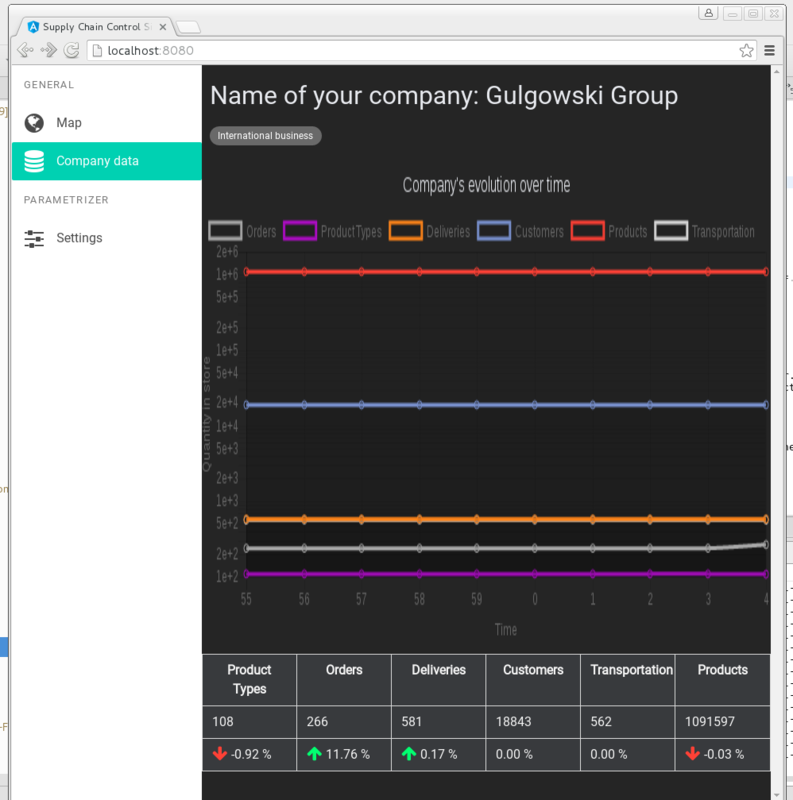 So here is my take on a Gateway Client API, sending IoT data to the cloud, consuming command & control from it. I wanted to have a simple API, easy to understand, readable. Preventing you from making mistakes in the first place. And if something goes wrong, it should go wrong right away. Currently we go with MQTT, but there would be an option to go with HTTP as well, or AMQP in the future. And also for MQTT we have Eclipse Paho and FUSE MQTT. Both should be available, both may have special properties, but share some common ground. So implementing new providers should be possible, while sharing code should be easy as well. Looks pretty simple right? 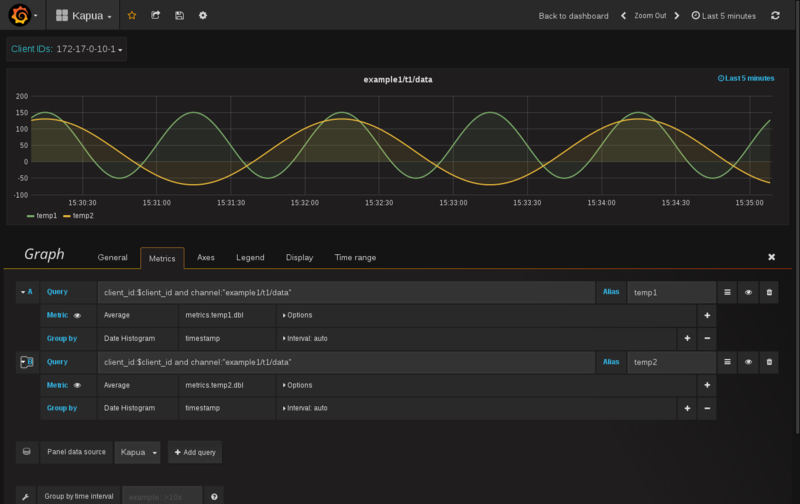 On the background the MQTT connection is managed, payload gets encoded, birth certificates get exchanges and subscriptions get managed. But still the main application is in control of the data flow. If you want to have a look at the code, it is available on GitHub (ctron/kapua-gateway-client) and ready to consume on Maven Central (de.dentrassi.kapua). But please be aware of the fact that this is a proof-of-concept, and may never become more than that. With this dependency you can use the example above. If you want to got for Paho instead of FUSE use kapua-gateway-client-provider-mqtt-paho instead. Then you need to re-configure the component over the “Paper UI” and point it towards your Kapua setup. Maybe you will need to tweak the “kapua.persist” file in order to define what gets persisted and when. And if everything goes well, your temperate readings will get pushed from SmartHome to Kapua. I am happy to announce that Eclipse Kapua got two slots in this year’s Google Summer of Code. Yes, two projects got accepted, and both are for the Eclipse Kapua project. Anastasiya Lazarenko will provide a simulation of a fish tank and Arthur Deschamps will go for a supply chain simulation. Both simulations are planned to feed in their data into Eclipse Kapua using the Kura simulator framework. Although both projects seem to be quite similar from a high level perspective, I think they are quite different when it comes to the details. The basic idea is not to provide something like a statistically/physically/… valid simulation, but something to play around and interact with. Spinning up a few virtual instances of both models and hooking them up to our cloud based IoT solution and interact a bit with them, getting some reasonable feedback values. For Kapua this will definitely mean evolving the simulator framework based on the feedback from both students, making it (hopefully) easier to use for other tasks. And maybe, just maybe, we can also got for the extra mile and make the same simulations available for Eclipse Hono. Apache Camel 2.19.0 is close to is release and the OPC UA component called “camel-milo” will be part of it. This is my Eclipse Milo backed component which was previously hosted in my personal GitHub repository ctron/de.dentrassi.camel.milo. It now got accepted into Apache Camel and will be part of the 2.19.0 release. As there are already a release candidates available, I think it is a great time to give a short introduction. In a nutshell OPC UA is an industrial IoT communication protocol for acquiring telemetry data and command and control of industrial grade automation systems. It is also known as IEC 62541. The Camel Milo component offers both an OPC UA client (milo-client) and server (milo-server) endpoint. Afterwards you can connect with the OPC UA client of your choice and subscribe to the item test-item, receiving that random number. Once Camel 2.19.0 is released, I will also mark my old, personal GitHub repository as deprecated and point people towards this new component. And of course I am happy to get some feedback and suggestions. Every now and then it is fun to leave the environment you are used to and do something completely different. So this journey take me to IntelliJ and Windows 10. And yes, I am glad to be back in Linux/Eclipse-land. But still, I think something rather interesting came out of this. It all started when I helped my colleague Aurélien Pupier to get his environment ready for his talk at the Eclipse IoT day Grenoble. If you missed this talk, you can watch a recording of it. He wanted to present the Camel Developer Tools. The problem was the he was working on a Windows laptop. And he wanted to demonstrate Eclipse Kura in combination JBoss Tools IDE. However Kura can only run on Linux and he wanted to run the JBoss Tools native on his Windows machine. Of course you could come up with some sort of Virtual Machine setup, but we wanted something which was easier to re-produce in the case there would be some issue with the laptop for the presentation. The first step was to create a docker image of Kura. Currently Kura doesn’t offer any support for Docker. So that had to be created from scratch. As there is even no x86_64 distribution of Kura and no emulator distribution, it was necessary to do some rather unusual hacks. The background is, that Kura has a rather crude build system which assembles a few distributions in the end of the build. 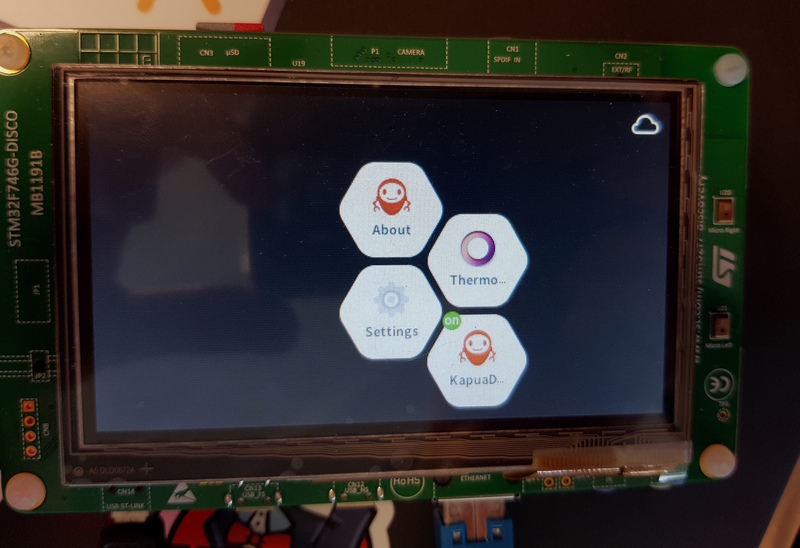 Kura also requires some hardware interfaces in order to work properly. For those hardware interfaces there exist emulator replacements for using in a local developer setup. However there is neither a distribution assembly for x86_64 nor one using the emulator replacements. The whole build system in the end is focused around creating Linux-only images. The solution was to simply rip out all functionality which was in the way and create a patch file. This patch file and the docker build instructions are now located at a different repository where I can easily modify those and hook it up to the DockerHub build system: ctron/kura-emulator. Currently there are three tags for docker images in the Kura Emulator DockerHub repository: latest (which is the most recent, but stable release), 3.0.0-RC1 and develop (most recent, less stable). As there is currently no released version of Kura 3.0.0, the latest tag is also using the develop branch of Kura. The 3.0.0-RC1 tag is a stable version of the emulator which is known to work and won’t be updated in the future. 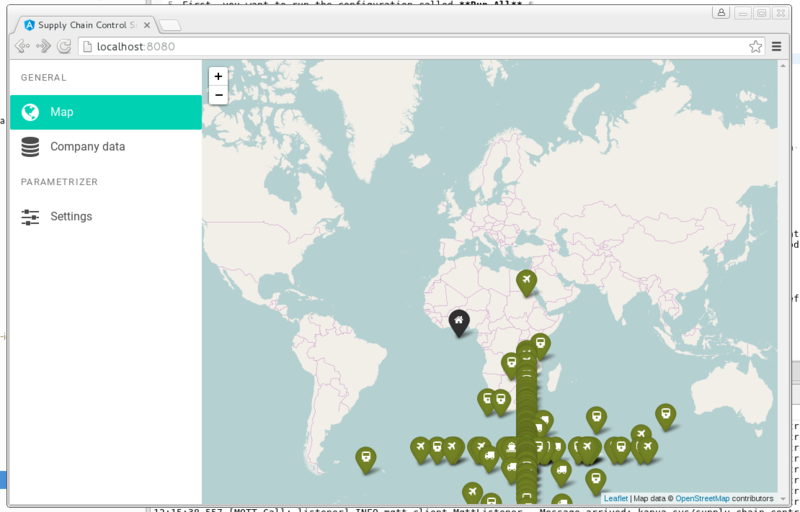 And afterwards you can navigate with your browser to http://localhost:8080 and use the Kura Web UI. As Docker is also available for Windows, this will work the same way on either Linux or Windows, and although I didn’t test it, it should also work on Mac OS X. As the Camel tooling makes use of JMX, it was necessary to also enable JMX support for Kura, which normally is not available with Kura. By setting the JAVA_OPTS environment variable it is not only possible to enable JMX, but also to enable plain Java debugging for the docker image. Of course you will need to publish the selected ports with -p when running the docker image. 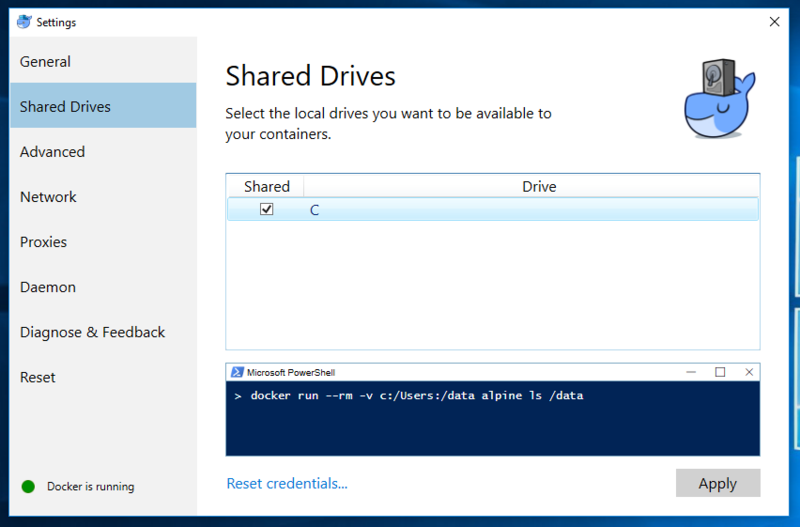 And for Windows you cannot simply use localhost but you will need to use the IP addresses created by docker for windows: also see README.md. After the conference was over, I started to think about what we actually had achieved by doing all this. We had a read-to-run Kura image, dockerized, capable of running of Windows (with docker), debuggable. The only part which was still missing was the ability to add a new, custom bundle to the emulator. Apache Felix File Install to the rescue! In the past I created an Apache Felix File Install DP for Kura (DP = deployment package for Kura). File Install works in a way that it monitors a directory and automatically loads, unloads and updates an OSGi JAR file which you drop into this directory. The DP can simply be dropped into Kura, which extends Kura with this File Install functionality. So I pre-seeded the Kura docker image with the File Install DP and declared a volume mount, so that you can simply mount a path of the docker image onto your host system. Dropping a file into the directory on the host system will make it available to the docker container and File Install will automatically pick it up and start it, but inside the docker container. Currently Kura requires you to use a rather complicated setup for developing applications for Kura. You will need to learn about Eclipse PDE, target platforms, Tycho for Maven and bunch of other things to get your Kura application developed, built and packaged. I already created a GitHub repository for showing a different way to develop Kura applications: ctron/kura-examples. 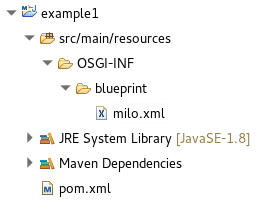 Those project use plain maven, the maven-bundle-plugin and my osgi-dp plugin to create the final DP. Those examples also make use of the newer OSGi annotations instead of requiring your to craft all OSGi metadata by hand. So it was time to update my Apache Camel component for IEC 60870 and finally release it to Maven Central with proper dependencies on Eclipse NeoSCADA 0.4.0. For more information about the see my page about the IEC 60870 Apache Camel component. But of course it can also be used outside of OSGi. In a standalone Java application or in the various other ways you can use Apache Camel.